Choose Run or Open anytime you are prompted. If a warning screen appears, click more info and run anyway. Click Next on the Setup Welcome Screen. Read and accept the Terms of Service. Click OK on Install Complete. 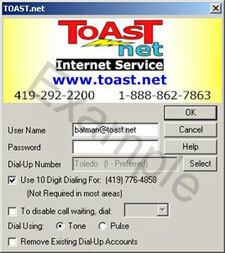 You will now have a TOAST.net Dialer icon on your desktop. Double click to open it. 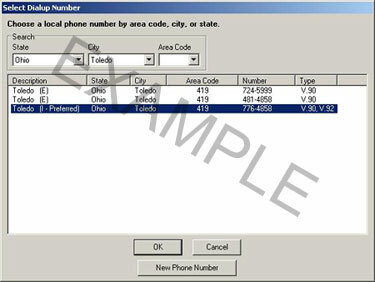 Enter your Username, Password, and make sure the dialing settings are correct for your location. Click OK when complete. Recommended: Dialup users may want to install the TOAST.net Web Accelerator to increase performance. @toast.net Email -- Sign in to the Start Page to access your email. Use the Other Email icon to access subaccounts. You may also access your email through your smartphone. My Account -- Log in with your username and password to view your current balance, edit your billing information, create additional mailboxes, and more! Support -- Go to our online support at www.toast.net/support to view our Knowledge Base, see frequently asked questions, or contact us online.